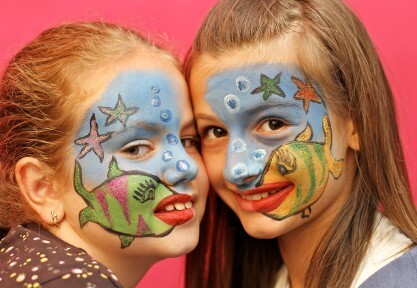 Here are some great ideas for throwing a fish party. Feel free to post your ideas as well. Swedish Fish: Buy the gummy candy in the shape of fish. Can also be used a decoration on a cake. Cake: An alternative to cutting a cake into the shape of a fish, use a square cake mold, draw a lake on it with a boy or girl fishing. You can use a wallet-sized photo of your child to personalize the child on the cake. Place gummy fish around the "lake" (use same number as birthday, and/or as markers for the candles), with one on the hook of the child fishing. You can give a 3-D look to the cake by having the gummy fish sticking out of the "lake"; use a graham cracker for a "dock", and sit a small figure at the end of the dock with a gummy fish on the hook. The side of the cake can be shaped like waves. Use your imagination. Gummy Worms: Fish like worms! Using standard or construction paper, cut out and color fishshapes; then place a paper clip on the front as the mouth of the fish; take a twig (or small piece of doweling), tie a string and magnet to it (magnets can be bought at an art store for pennies), and you have your "fishing pole". Place them into a large cardboard box, or a box of your choice (for realism, you can decorate the box to look like the sea, with sea animals inside and out). Prizes: It is recommended that you use the same prize. foreach fish caught, the player wins a gummy fish - this way everyone gets something, but the winner still gets a "little extra" for winning. Takea fish bowl, fill it with pennies, nickels and dimes and quarters (morepennies than nickels, more nickels than dimes, more dimes than quarters, etc.) and most important - marbles. The winner gets to dip into the money bowl for each fish they caught. There's one catch - with each handful, they must put the marbles back, and the bowl remixed before they reach in again. This will allow for more turns at the money bowl. Instead of handing out party bags, they can exchange their "fish" for prizes (i.e. - fish-shaped stencils, erasers, candy, etc.). This is a variation of the old-time favorite - pin the tail on the donkey. Use your computer to print out a picture of a largefish (use 8.5" x 14", the larger the better - you can even take an 8.5 x 11 inch printout to Mail Boxes Etc. and have them enlarge it to 11 x 17 inch or larger for only a couple of bucks). Then make copies of the tail (or trace them onto one sheet to get more out of it), cut them out, color them the same color as the real tail, and voila, you have Pin the tail on Moby. This can be adapted for most parties and themes and only costs you the paper. You place 5-10 gummy worms (whatever number) on a plate in front of the kids. The idea of the game is to see how many worms you can Eat Like A Fish in thirty seconds. This means that there are no hands used! Placemats Print out a fish on 8.5" x 11" or 8.5" x 14" paper, and you have a throwaway place mat. Streamers: Print out and/or cut out fish shaped pieces of paper (use different colors), and string them together as a "school of fish" which go from one end of the room to the next. You can also attach them to regular streamers with tape, and twist the streamers to simulate waves. Where it meets in the center, you can use a blue piece of construction paper, shape it as rippling water, and hang a piece of string with a hook on it (andmaybe even a gummy worm for realism), and this can be where the fish go up for food and continue on. Decorate Your Steps: Have the kids use blue construction paper to cut out waves and tape them to your steps, your floor, around a snack bowl, just go nuts and have fun with this. Photos: If you have a digital camera, take pictures of each of the kids and email the picture to their parents. Thanks You's: You can also stick the Polaroid's into the thank-you's, or if your film processing center gives you an option for "pictures-on-disk", print your own thank-you's with the kids who attended the party on the front. You can put the clip art of the fish on first then put the party image on top of that with a border!. I am looking for games for a teenager luau party help please!